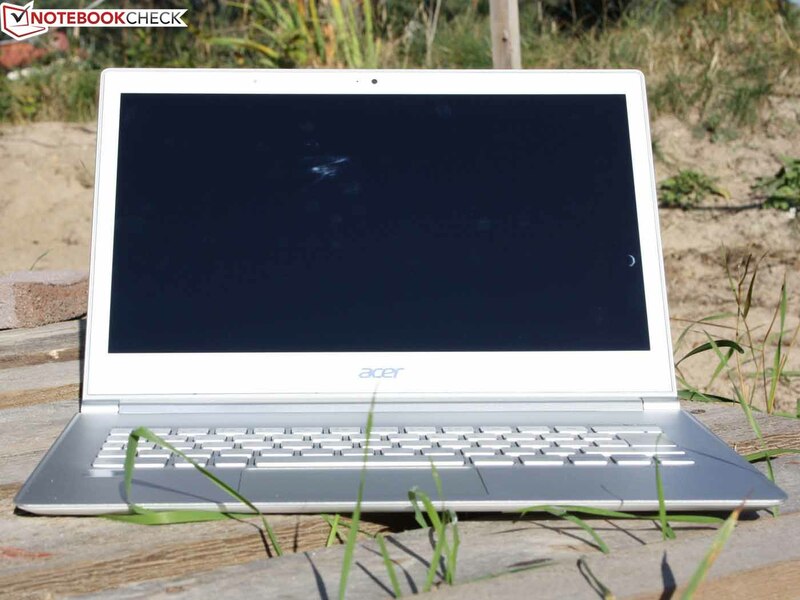 Acer S7-391-73514G25aws - the 13.3-incher takes a new path: IPS panel and an unrivaled thin case. 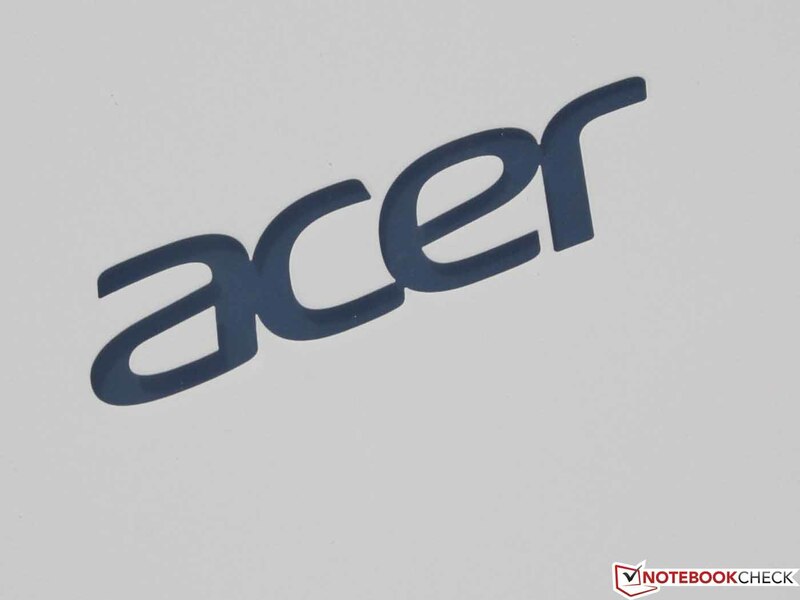 The S7 is Acer's ultrabook F1 car. This applies not only to the 13.3-inch form factor, but also to the hardware. On the outside - a gem made of solid magnesium and Gorilla Glass 2. On the inside - Core i7, 256 GB RAID SSD, and a Full HD IPS panel. 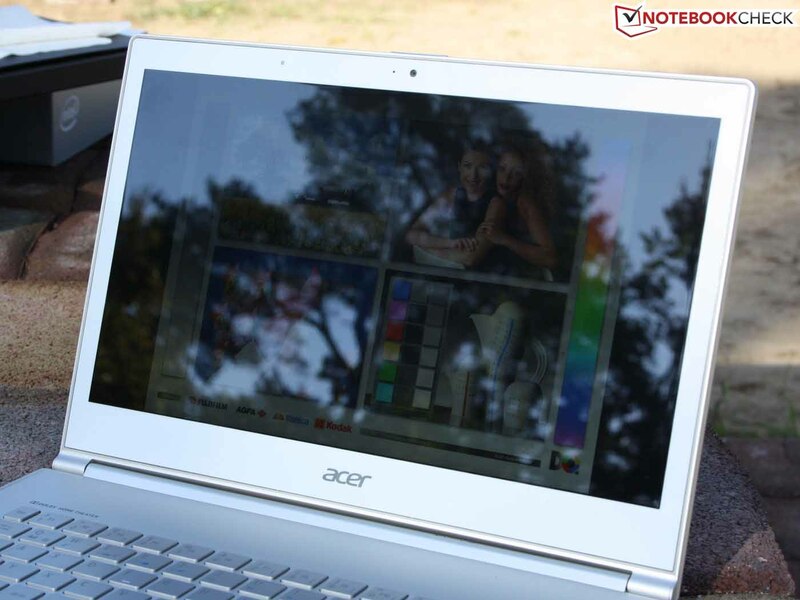 That's right: outstanding viewing angles and vibrant colors in an Acer notebook. This is something that has not happened before. Even the sister model S5-391, a high-end ultrabook with similar hardware (i7, RAID) only had an HD panel with meager contrast and viewing angles of an ordinary laptop. 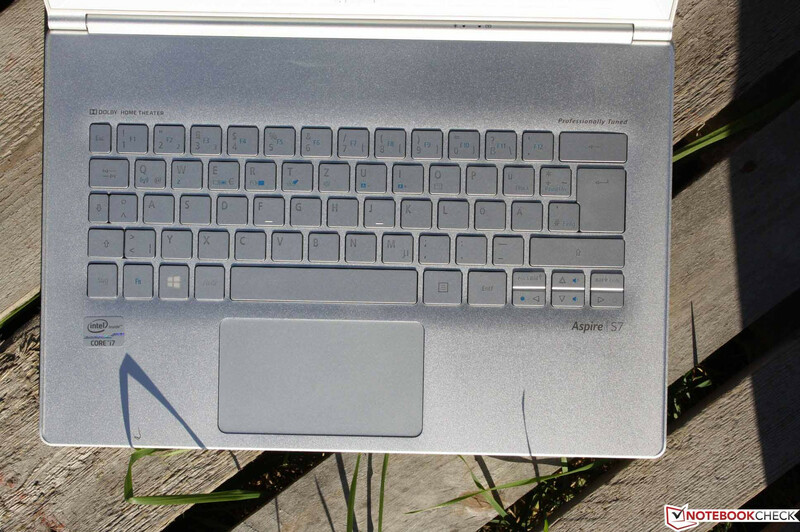 Another rarity: the Aspire S7 is our first test candidate running Windows 8. With a 1300 to 1700 Euros price tag (our test unit, ~$1684 to $2202), the luxury model does not cost petty cash. But if it delivers the promised display, performance, and workmanship, then the price is competitive. 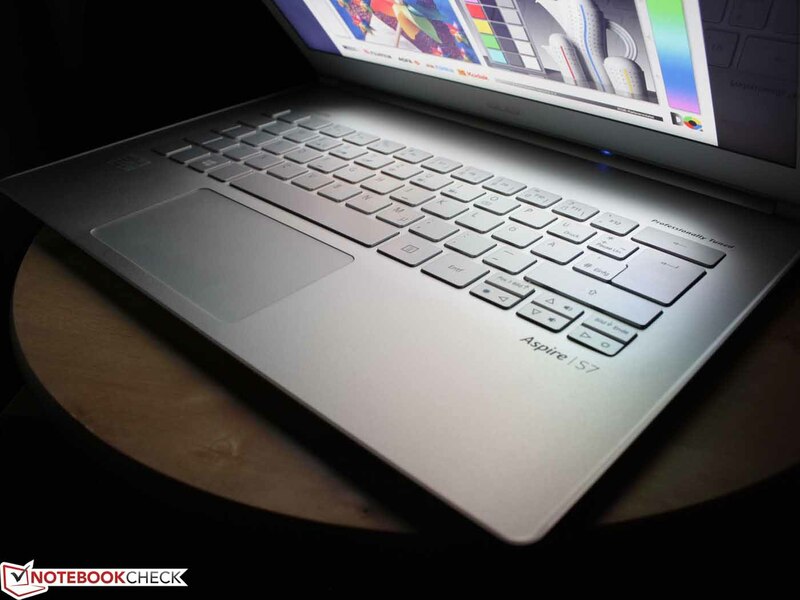 You can read all that you need to know about the 14-inch Aspire S7 in our detailed review. 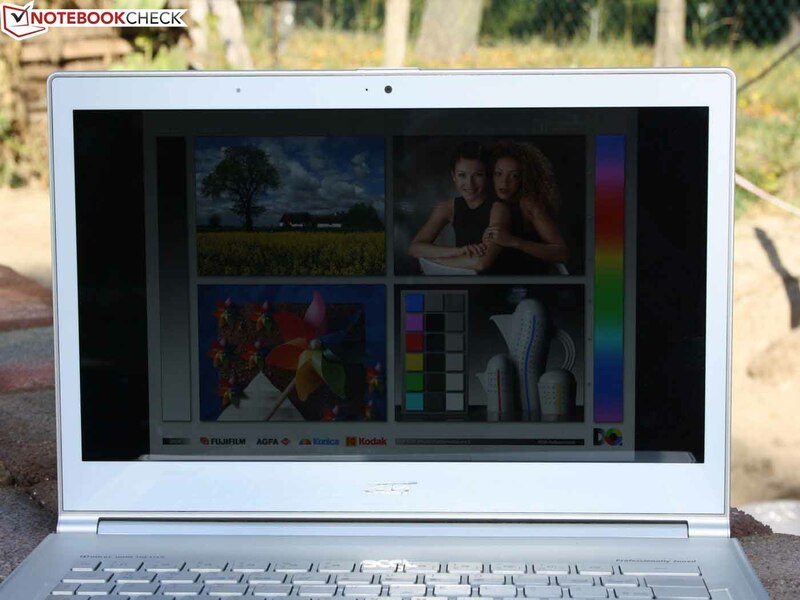 The rivals are: Asus Zenbook UX31A (FHD IPS), Samsung Series 9 900X3C and Apple MacBook Air 13 (Unibody). The chassis is completely flat (magnesium). The rubber strip lines the whole frame. The lid sits recessed in the base unit. Lid reinforcement of Gorilla Glass II. Acer has really put an effort into making the case stable, despite its thinness (maximum height of 12 mm plus 1.5 mm for the feet). We are pleasantly surprised: the base unit is almost stiff as a board; the chassis cannot be bent either lengthwise, or diagonally. During prolonged typing on the train, we noticed a drawback: the front and side raised edges of the working space are pretty sharp. The edgy look has its visual appeal, but also its downsides in everyday use. The raised side edges have two functions according to Acer: they stabilize the base unit and allow for a deeper immersion of the display lid (reduced height). The lid consists of an aluminum frame, in which a Gorilla Glass II is used on the outside as a stiffening surface. This does attract fingerprints, but also adds strength. The lid can be twisted only to a limited extent. The working space is not entirely flat - the keys lie in a slight groove. This serves to even the edges of the keys with the rest of the surface. This is an important detail, since the display panel lies flush with the work surface. To prevent the display from being scratched or dented by the keys, the bezel has a small rubber strip. But it does not protrude out. Can this function properly? We noticed that when the lid is closed, the aluminum TFT frame and the magnesium work space come in direct contact. This might lead to abrasions after some time. 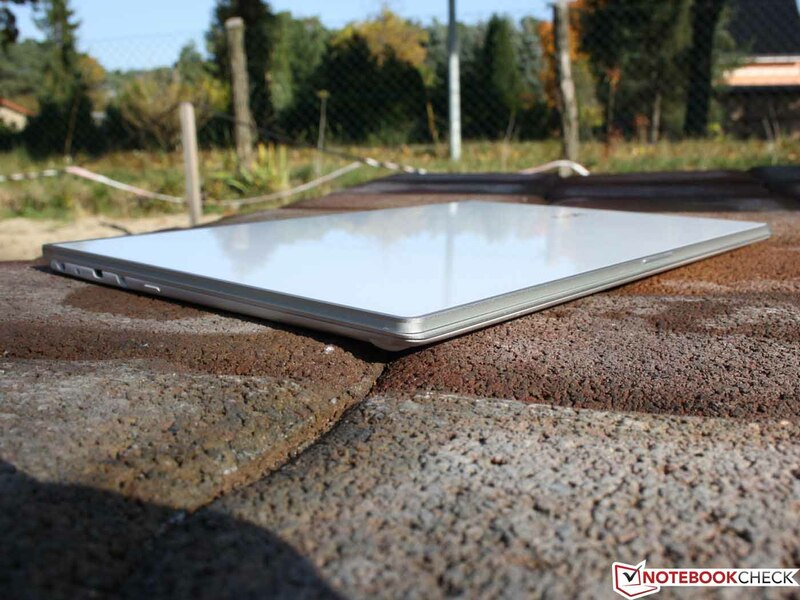 We advise users to always transport the device with the polishing cloth placed on the keyboard. Given that Acer has manufactured it precisely to a tenth of a millimeter, the gap between the panel and the keys is extremely small. Even the touch typing markings could come in contact with the display. 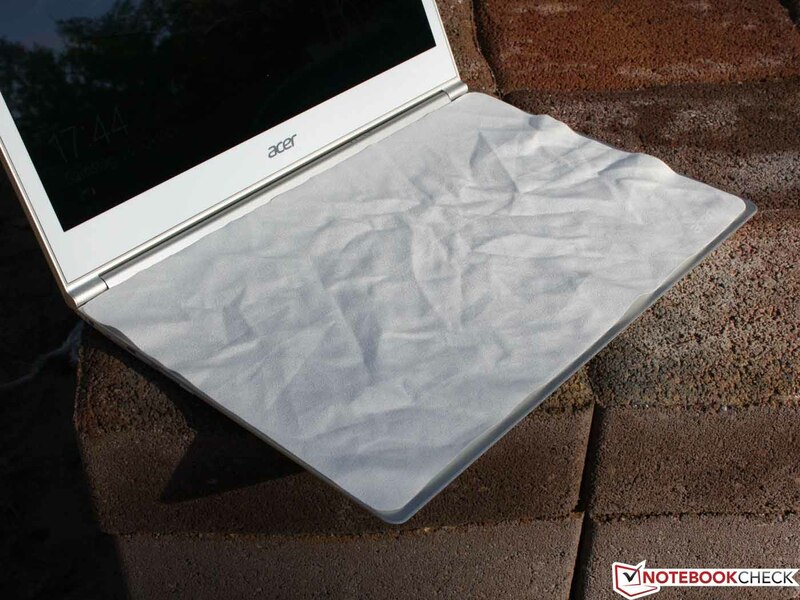 Such a flat notebook raises the question of efficient cooling. 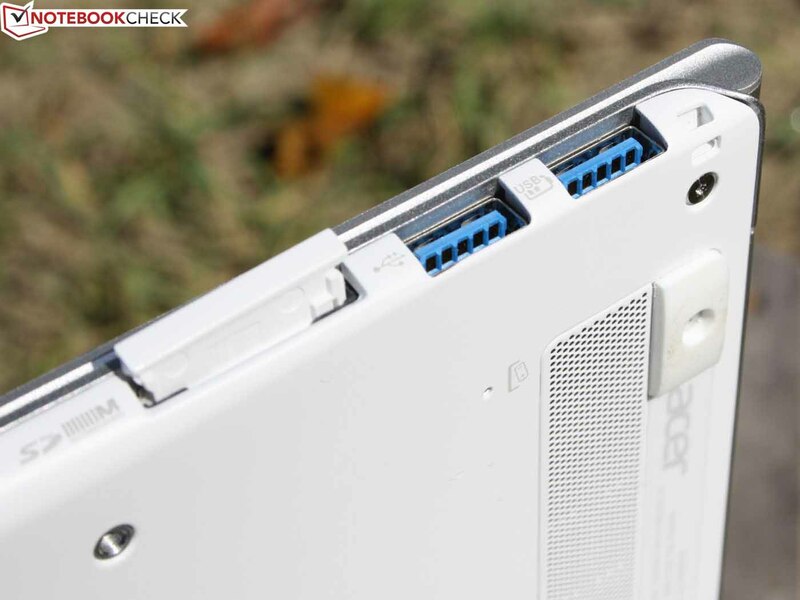 Acer claims to have solved this problem via the dual fans. One fan draws cool air in (small opening) and the other one blows the hot air out through the radiator (large opening). The processor is, per usual, connected to the radiator via a copper heat pipe. In the Emissions section we'll discuss whether this helps with the noise and heating. The S7 has no maintenance covers; the battery is integrated. There isn't much to upgrade or exchange. The two SSDs (RAID 0) are small modules connected to the SATA ports (no 2.5- and 1.8-inch SSD). The system memory (4 GB) is soldered. The S7 does not have a lot of room for interfaces; VGA and Ethernet are out of the question because of their height. Two USB 3.0 ports as well as a micro HDMI and a card reader remain. In order to cater for users with external monitors, Acer has supplied a micro-HDMI to VGA adapter. 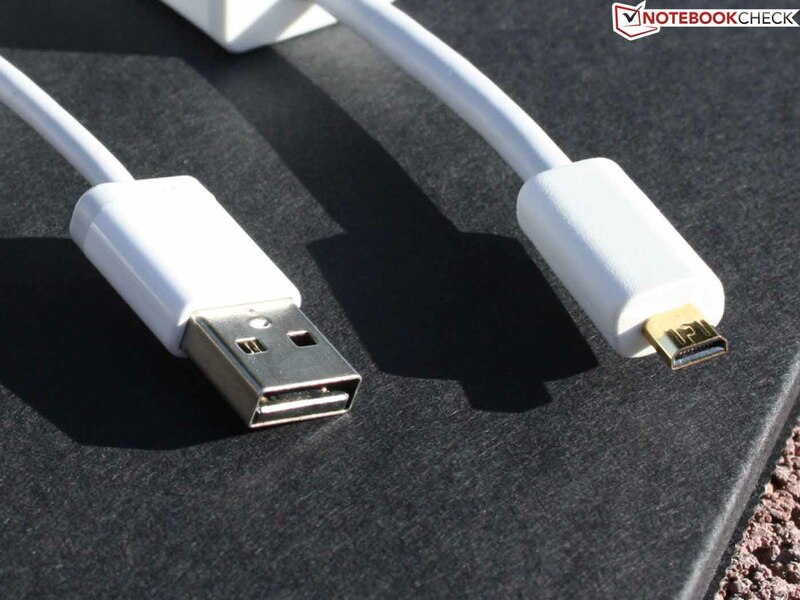 Ethernet fans also receive a USB to RJ45 dongle. It only supports fast Ethernet. The above mentioned interfaces are supplemented by DraftN WLAN and Bluetooth 4.0. 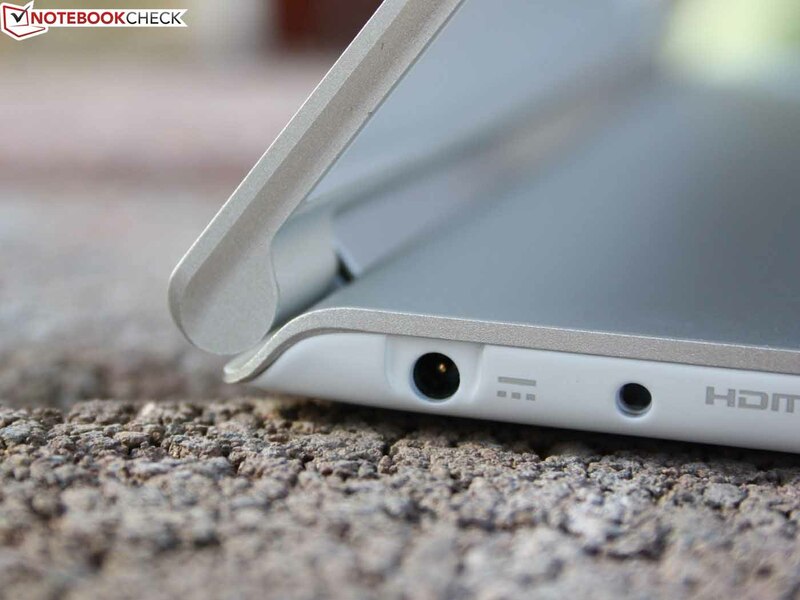 But these are also found in low-cost devices, such as the Lenovo IdeaPad S206. 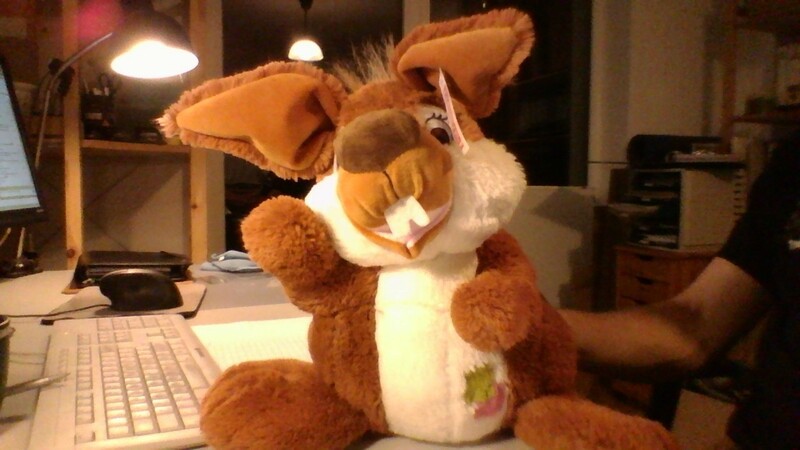 The 1.3 MP webcam delivers a decent picture in low light, though not very good. As long as the subject doesn't move, the contours are sharp and the blurred areas are limited. The colors have a high contrast. The status LED in the upper TFT bezel indicates operation. 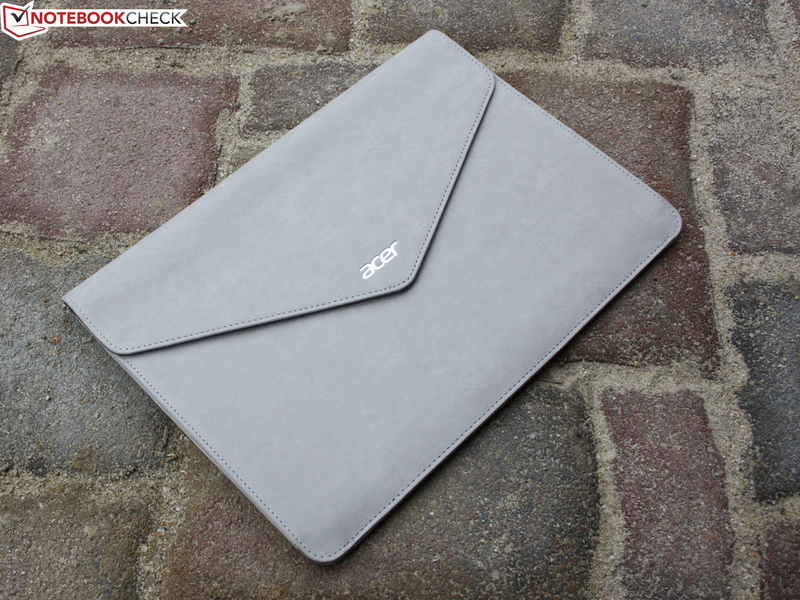 The high-quality packaging includes as standard a slim case, which is optimal for the 12-millimeter notebook. Then we have the two afore-mentioned adapters (Ethernet, VGA). Those who want to use a standard HDMI will need another one. There is no disk with the Windows 8 Pro (64 Bit) or the drivers. The user is prompted to burn a recovery backup via the Recovery Manager. We see less in terms of software features. While Sony and Samsung bundle all the tools under one roof (Vaio Care), Acer seems to have a different tool for everything. This might be an exaggeration, but tools like "Power Button Function" make us doubtful. There are no full versions of commercial software. CyberLink's Media Espresso is pre-installed as a free version. 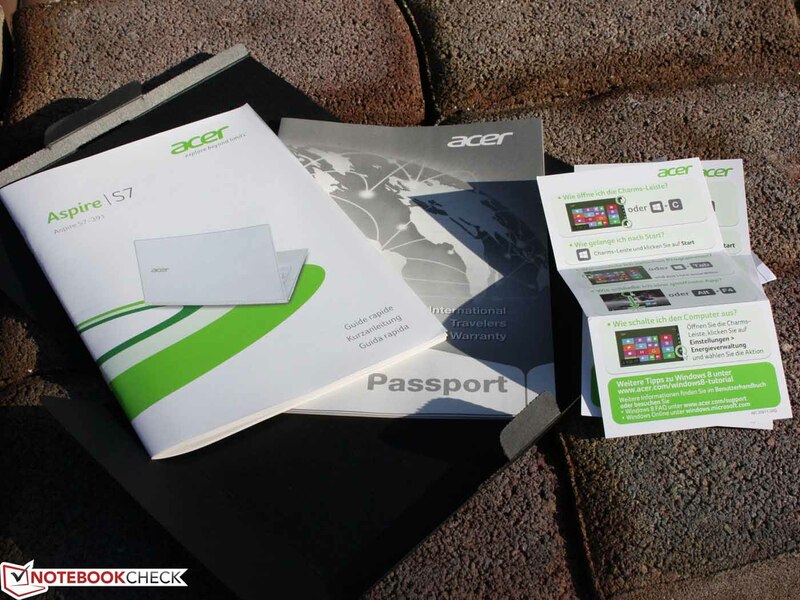 24 months of Collect & Return (will be picked up) is the standard warranty for Acer's high-priced notebooks. The devices under 1000 Euros (~$1290) come with only 12 months of Bring-In service. 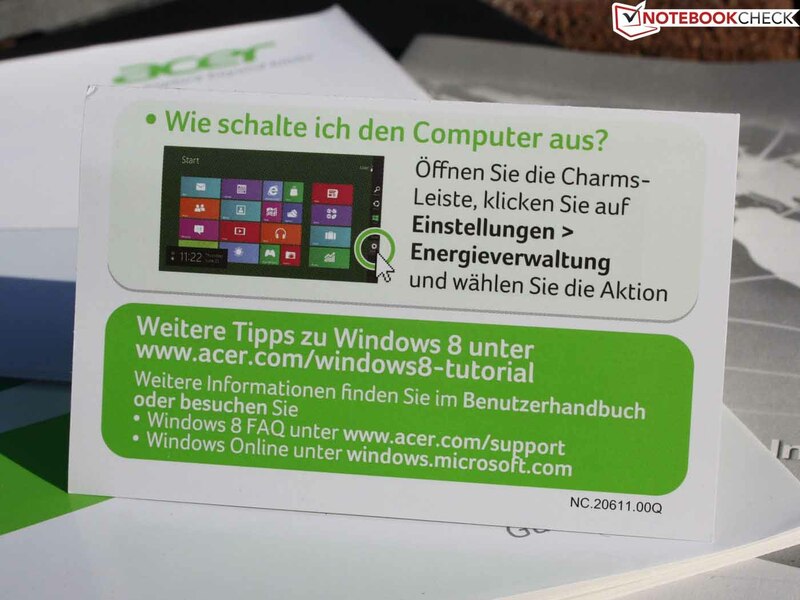 This can extend up to three years for 90 Euros (~$116); for 100 Euros (~$129), Acer sells the Notebook accident and breakdown cover. Its duration is one year and covers, for example, theft and burglary (including in a car) and breaks or damages caused by liquids. 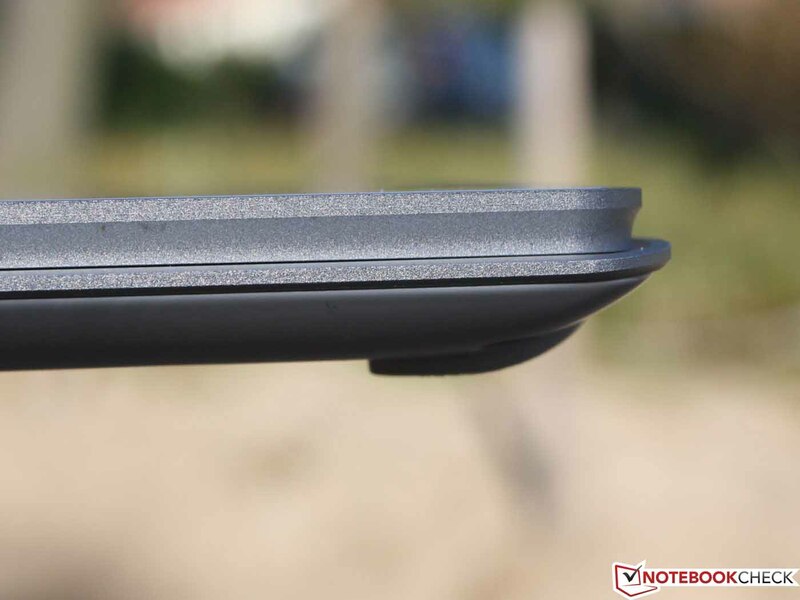 The low height of the notebook naturally reduces the key drop. This is also true here. The firm stop (the keys are fixed well) at least ensures a proper feedback. The pressure point is sufficiently clear, but not crisp, which is expected given the short drop. The competitors do not offer clear key drop either. The layout is typical for an Aspire, but shows some changes. The F and Fn key rows are gone and are instead assigned as a second function of the numbers row and the top row of letters. This leaves more space for the input. Wasted? Not at all. On one hand, the processor and the cooling system are underneath; these are the tallest hardware parts. On the other hand, users can rest their hands while using the touch screen. The Elan SmartPad does not have separate buttons. The touchpad functions like a rocker, where the mouse buttons are located underneath the bottom right and left. 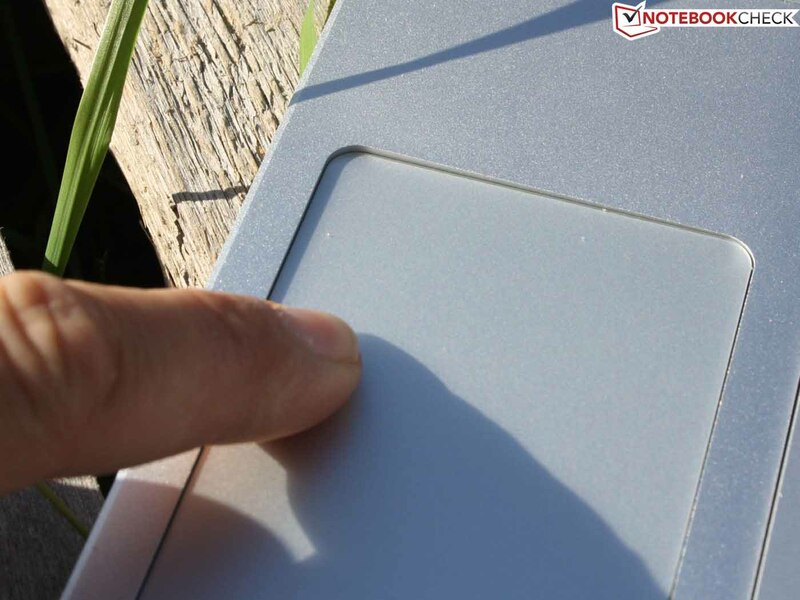 For cursor movement, the relatively smooth surface is sensitive up to the edges. The vertical and horizontal scroll bars are not adjustable. The usual multi touch gestures are fully supported. The SmartPad has a sufficient stroke and clicks quietly. 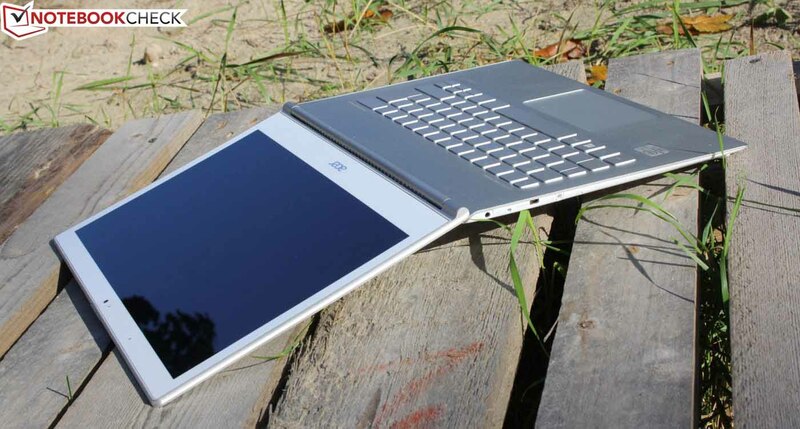 Matching to the Windows 8 system, the S7 has a multi-touch panel for input via the fingers. The lid can be opened to more than 180 degrees. When the S7 lies on the table for presentations, the screen image can be rotated in all four directions via the Fn + screen rotation buttons. Thus we can show the person opposite us the screen content, without turning the notebook. The second aid for the touch input: the hinges tighten after 100 degrees opening angle (dual torque hinges). Thus you won't push it back with your fingers. Up until that position, the lid can be easily opened using one hand. The Full HD panel has a homogeneous edge-to-edge surface. 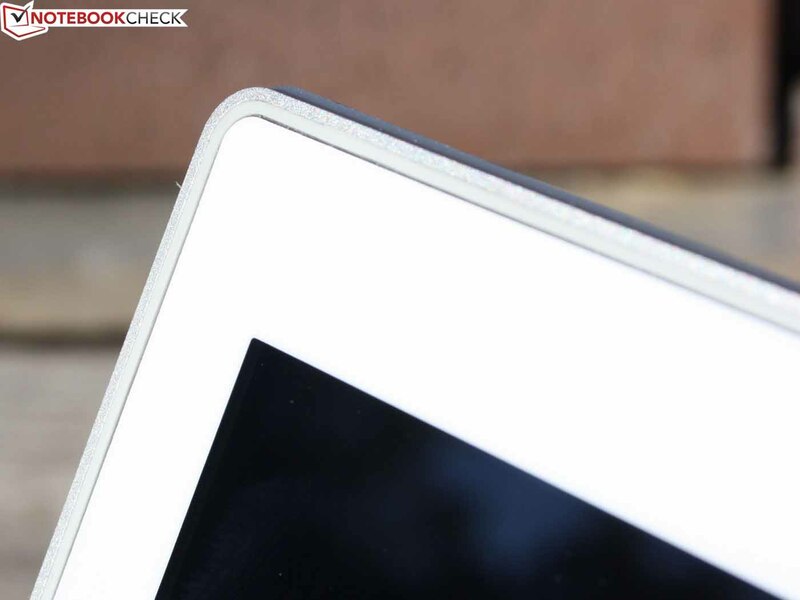 Just as with a tablet PC, there is no gap between the bezel and the sensitive area. 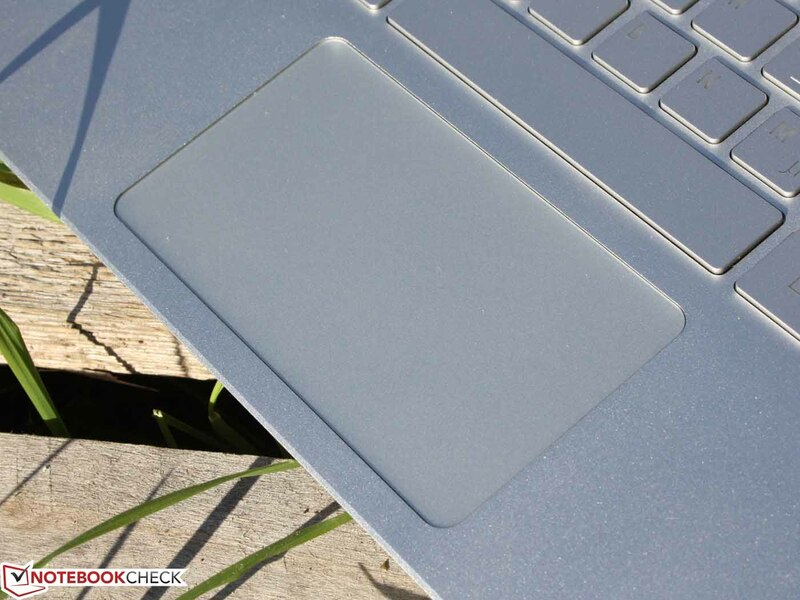 The surface mounted rubber strip does not hinder finger movement either. 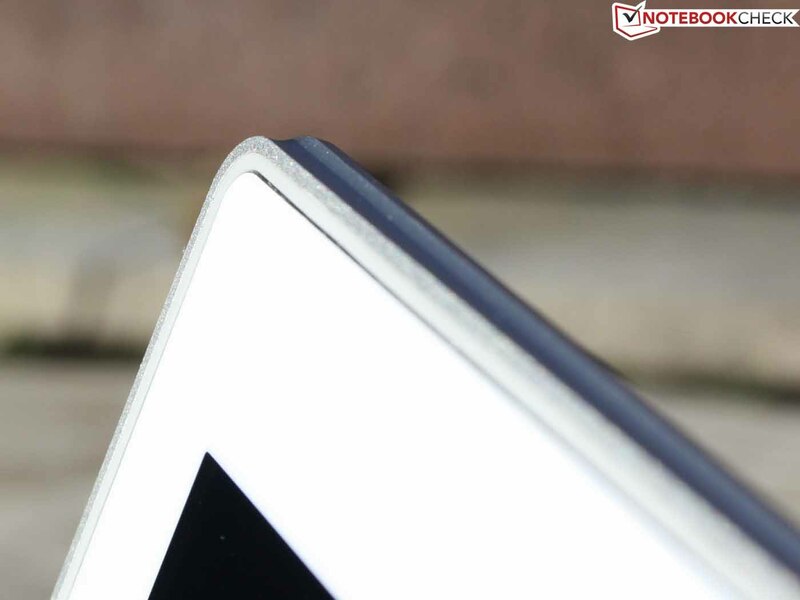 It is a relatively tough LCD surface, although the pressure resistance is not as good as that of a good tablet computer. Medium pressure on the panel leaves the typical for a notebook pressure points. Moreover, these occur under moderate pressure on the Gorilla Glass on the back cover. There are no problems with the fluid operation of Windows 8. The fast SSD RAID 0 provides quick program start-up. The 180 degrees opening angle is ideal for train use (tight space) and for presenting/playing on the table. The lid can be opened to more than 180 degrees. At around 100 degrees the second torque kicks in and the display hinges become tighter. The 13.3-inch panel of the S7 has a resolution of 1920x1080 pixels (Full HD). In addition we have the multi-touch functionality, which should go perfectly with Windows 8. The so called Acer ComfyView panel comes from the manufacturer AUO (B133HAN03, IPS) and is not matte. In contrast to the infamous TN panels of all Acer laptops so far (all price categories), for the first time we have an IPS panel with wide viewing angles and proper contrast. In terms of contrast ratio we measured almost 500:1. The color quality and side viewing angles are comparable to a good tablet screen. Similarly good displays we find among the competitors Asus Zenbook UX31A (FHD, IPS) and Samsung Series 9 900X3C (1600x900, PLS). The Apple MacBook Air 13 (1440x900, TN) has the qualitatively worse panel in this comparison. 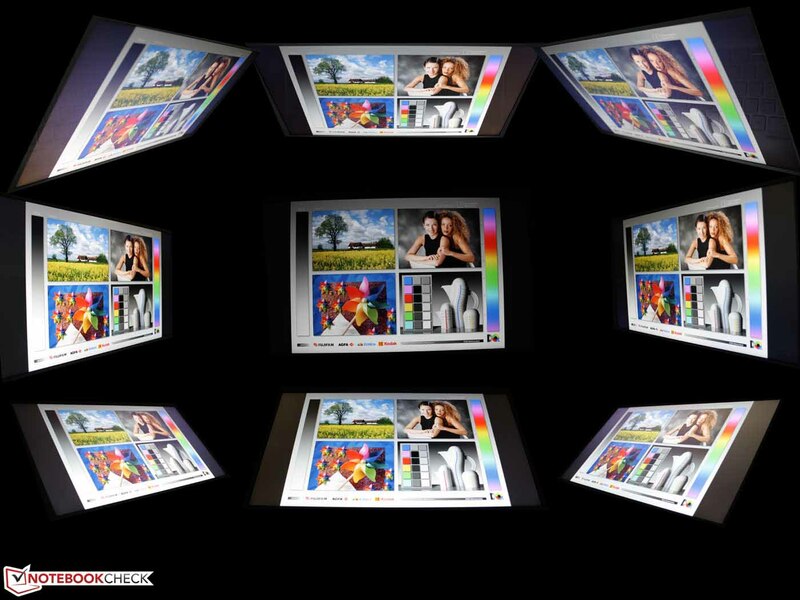 The color space reproduction is important for graphics and demanding image editing. The sRGB and the AdobeRGB color spaces were not fully covered. 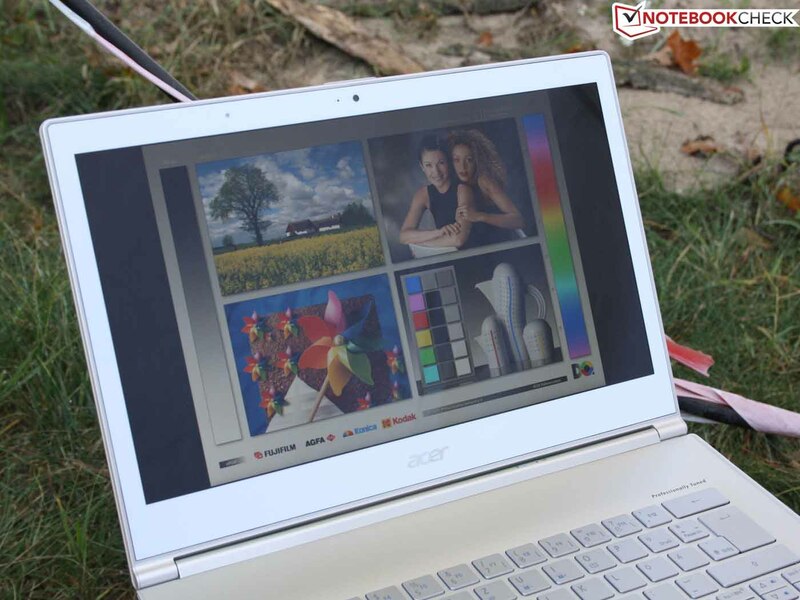 Of the three high-end ultrabooks, only the Asus Zenbook UX31A manages that. Its color space is significantly larger, as the direct comparison in the picture shows. But the S7 wins against the sister model Aspire S5-391, with a disappointing TN panel (image 3). The high brightness is one option for the summer. But wait, what is that? Brightness on battery: 165 cd/m². The LCD fades from the almost gigantic 373 cd/m² on power supply to this scarce luminance (cannot be disabled even in BIOS). The result is a too dark image in daylight. Only in the shadow is the desktop still legible. When we add reflections, everything is gone. The brightness sensor on the upper LCD frame did not alter our measurement, since the result was the same even in direct light. On AC power, we could observe how the sensor ensures an adaptive control of the screen brightness and the keyboard lighting. In terms of outdoor use, Samsung and Asus are vastly superior to the Acer S7 (anti-glare, high brightness). The MacBook is reflective, but significantly brighter (on battery power, otherwise not). The viewing angles of the display thrill us. Horizontally and vertically they are about 85 degrees. This is in accordance with an IPS panel (In Plane Switching). Regular TN panels (Twisted Nematic; for example Aspire S5-391) do not exceed 45 degrees horizontally and 15 degrees vertically. Within the comparison group, there are exceptions with wider horizontal angles (MacBook Air 13). But vertically, the TN competitors always have a clearly worse image. UX31A and Samsung 900X3C do not exceed these viewing angles. The Intel Core i7-3517U (2 x 1.9 GHz) is an ultra-low voltage processor with a TDP (thermal design power) of 17 W. According to Acer there will be an S7 model with Core i5-3317U. The frequency can be increased via Turbo Boost 2.0 up to 3.0 GHz (single-core load). We must take into account the temperature (performance drops when too hot), which we will clarify in the processor section. The Ivy Bridge i7 has a memory controller for DDR3 RAM and an Intel HD 4000 on board. In our test system the 4096 MB is permanently installed and thus not expandable. The storage consists of two mSATA modules, each with 128 GB capacity. The Lite-On CMT-128L3M modules in RAID 0 array (striping – acceleration without redundancy) have already provided for a very high performance in the Aspire S5-391. The Aspire S7 with the i7 costs 1700 Euros (~$2202). Does a cheaper i5 version suffice? We think so, since the Cinebench tests show this: the maximum performance difference is 15%. The R11.5 graph confirms: the TwinAir cooling system aids the Turbo Boost surprisingly well. The Samsung 900X3C and Aspire S5-391 with the same processor are 6-10% slower. Let us take a closer look: the frequency during CPU multi tests is constantly at 2.8 GHz. Only the stress test scenario with Prime95 on all cores dropped the Turbo temporarily down to 2.7 GHz. This is good news to everybody who feared throttling problems because of the 12 mm chassis. What the R11.5 test identifies is not proven by Wprime (S5-191 +17%), Super Pi, and Cinebench R10 Single/Multi (+/- 0%). 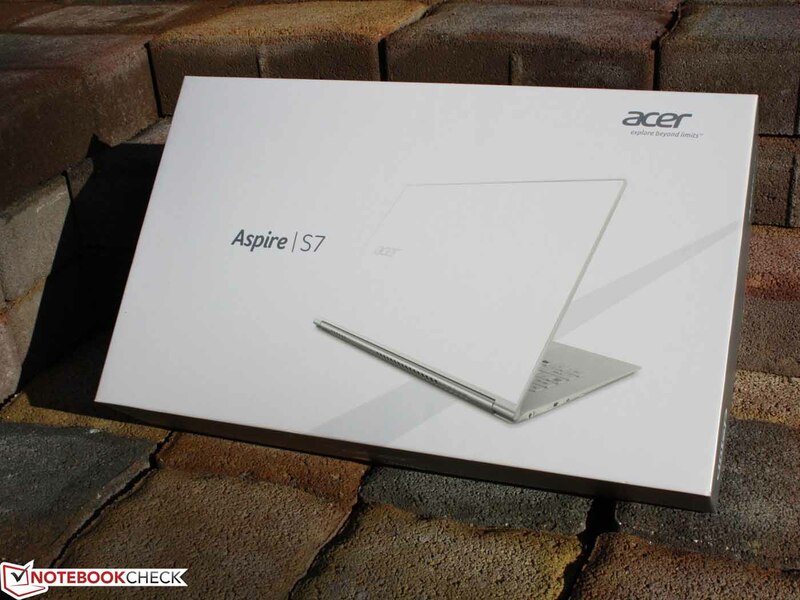 In the "worst" case, the i7 of the Aspire S7 is on an equal level. On battery power one does not have to give up performance. The R11.5 Tests (also OpenGL via GPU) showed identical results. The PCMark 7 evaluates application performance as a whole (PC Mark Vantage failed to complete). With 5020 points, the result is well ahead of the direct competitors (see the graph). Except for the MacBook Air 13, the SSD, be it RAID 0 or not, doesn't make a whole lot of difference. This System Storage Score illustrates this. The reason for the good PCMark 7 score is the RAID 0 SSD array by Lite-On (CMT-128L3M). The enormous read rate can be misleading: when reading small, scattered data (4K tests), the ADATA XM11 (UX31A) and Lite-On LMT-256M3M (900X3C) are faster. This is why the System Storage Score is not better than the competitors. The performance of the HD 4000 graphics chip has been proven in countless notebooks and subnotebooks. It is considerably faster than the HD 3000 predecessor, although there are large fluctuations among individual units. Refer to our Performance and Scaling Overview of Intel HD Graphics 4000. In short, there are two performance factors: The GPU clock frequency (for example 650-1350 MHz) and the capabilities of the cooling system. Our Core i7 3517U allows the HD 4000 to clock up to 1150 MHz (theoretically), this is the same as a Standard Voltage Core i5. But is the cooling efficient enough to keep this frequency constant? Apparently not, because during the R11.5 OpenGL test it varies between 950 and 1050 MHz. The benchmarks show varying results, when compared to an HD 4000 in a Standard Voltage dual-core processor (+18 but also -15%; MacBook Pro 13 and T430 respectively). 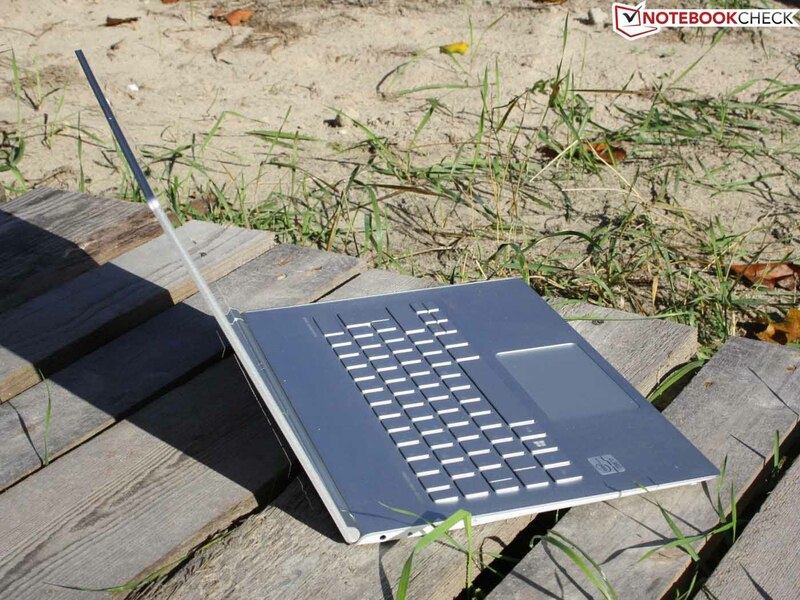 However, it is only fair to make the comparison with HD 4000 in other Low Voltage Core i5 and i7 notebooks. The 3DMark 06 resulted in 4953 points. 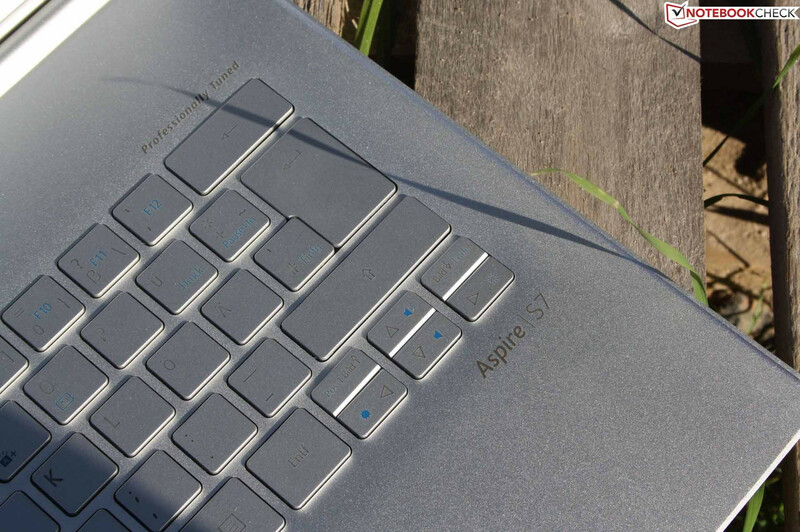 Here our Aspire S7 is sometimes faster (UX31A, S5-391), the same as (900X3C) or even slower (Air 13). 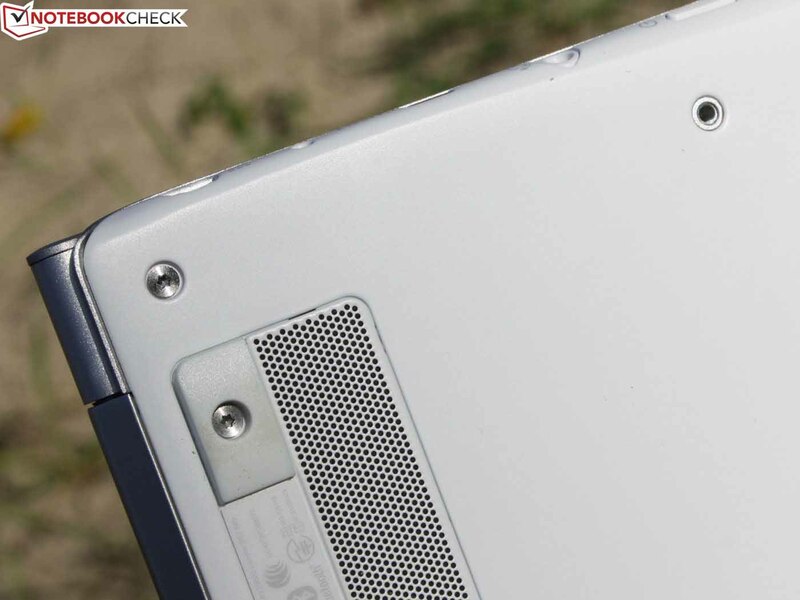 The processor graphics of an i5-3317U is up to 33% slower (IdeaPad U310). 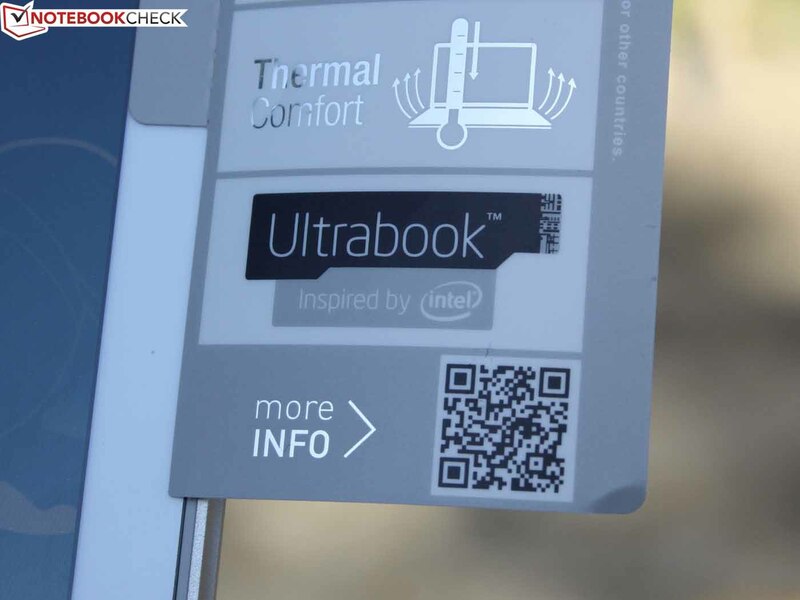 This varies depending on the efficiency of the cooling system, up to a tie (for example Zenbook UX32VD). We tested with Anno 2070 and Risen, whether the good synthetic scores translate into real game performance. Overall, the HD 4000 system performs worse when compared to an entry-level GPU, such as the GeForce GT 620M (Asus UX32VD, +90%). 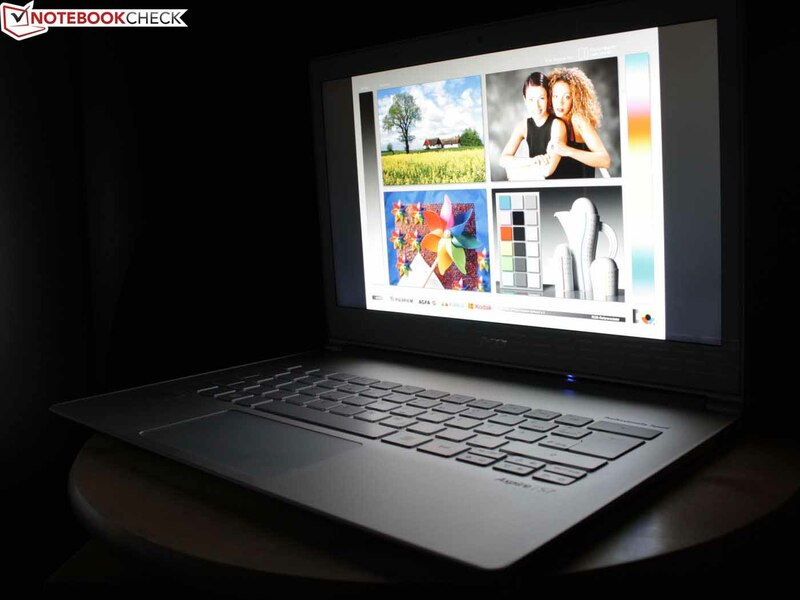 The other ultrabooks do not perform better, even the Air 13 with its above-average 3DMarks 06. Thus the user must do with lower resolution and deactivated anti-aliasing (lower details). Only undemanding modern games like FIFA 13 can be played smoothly on medium settings (IdeaPad S400). 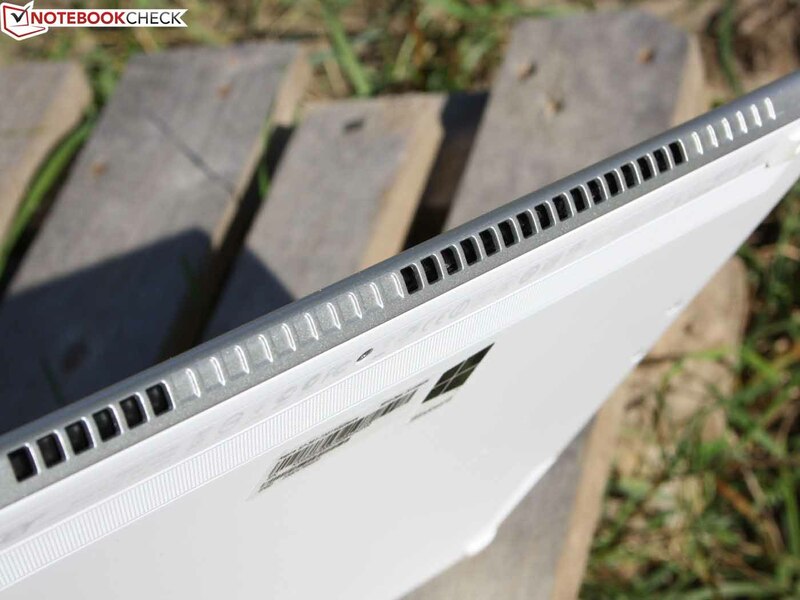 In terms of noise level, the 13.3-inch remains comfortable in idle and under low load, but the fan never turns off. Under low load it constantly spins with 32.6 dB(A). We can describe the fan controller behavior as cautious and slowly rising. Thus there are no abrupt increases in the noise level. When we tested under high performance, the noise reached 47.5 dB(A). Here it does not matter whether we stress test only the CPU with Prime95 or if we load the GPU with Furmark at the same time (classic stress test). This noise level is quite disturbing. In reality, the S7 should not be louder than 43.6 dB(A). This is the level we measured during 3DMark 2006 and gaming. 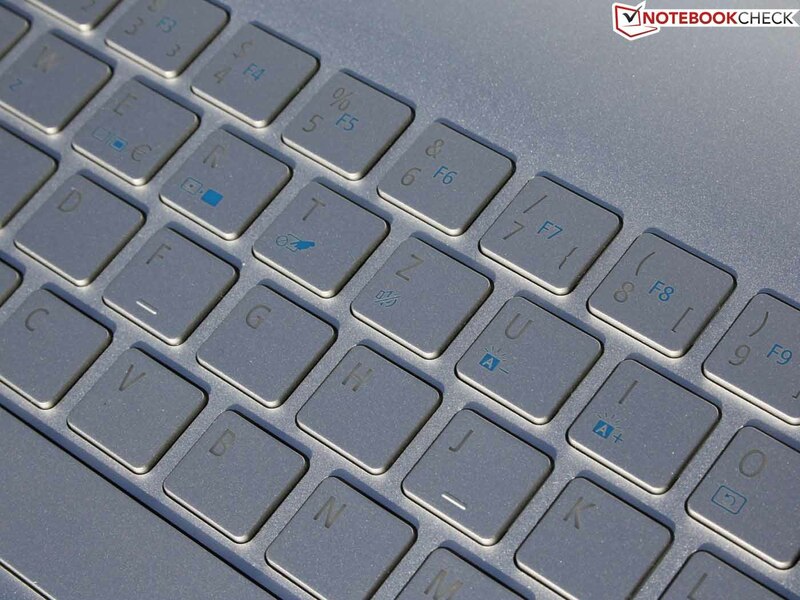 In idle the ultrabook remains cool in the areas of the keyboard and the palm rest. At the top and bottom, the temperatures are more or less around 30 oC. During office use, under low load and mostly idle state, the temperature rises only by a couple of degrees. So use on the lap is possible. Under load the temperature rises significantly (up to 48 oC), mostly in the rear area, where the processor and the cooling system are. However, below and above the keyboard, we measured temperatures of well below 40 oC. Thus the cooling fans works well. Our stress test is an extreme scenario, designed to test the effectiveness of the cooling system. During the stress test on the CPU and graphics for several hours, we noticed no CPU throttling with the S7. The Turbo Boost did not clock the processor up to 2.7 or 2.8 GHz, as with the Prime95 solo test. The 1.9 GHz is the standard frequency. Only a fall below that would indicate CPU throttling. HWinfo showed CPU temperatures at a maximum of 85 oC for the processor. (-) The average temperature of the palmrest area of similar devices was 28.6 °C / 83.5 F (-3.1 °C / -5.6 F). 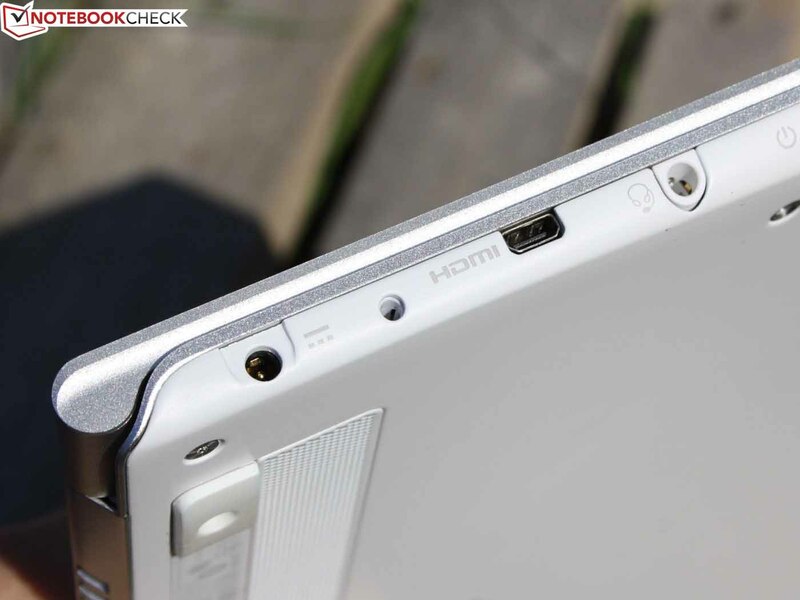 The Aspire S7 has two stereo speakers. These are located beneath the palm rests and direct the sound towards the table. In order to leave enough space for the sound waves, the front feet are located directly next to the speakers. This is necessary, because without a table the sound becomes thin and washed out. The Dolby logo on the case refers to the Dolby Advanced Audio Codec (Surround), which significantly enhances the sound depending on the profile and settings. The user should not expect too much of it, since the effect is most notable with headphones or external speakers. The tiny speakers with low height are what they are: weak speakers with no volume. The sound is clear and without distortion even at high levels, although there are no distinct highs or lows. The Power Manager indicates USB devices and applications that use a lot of energy. 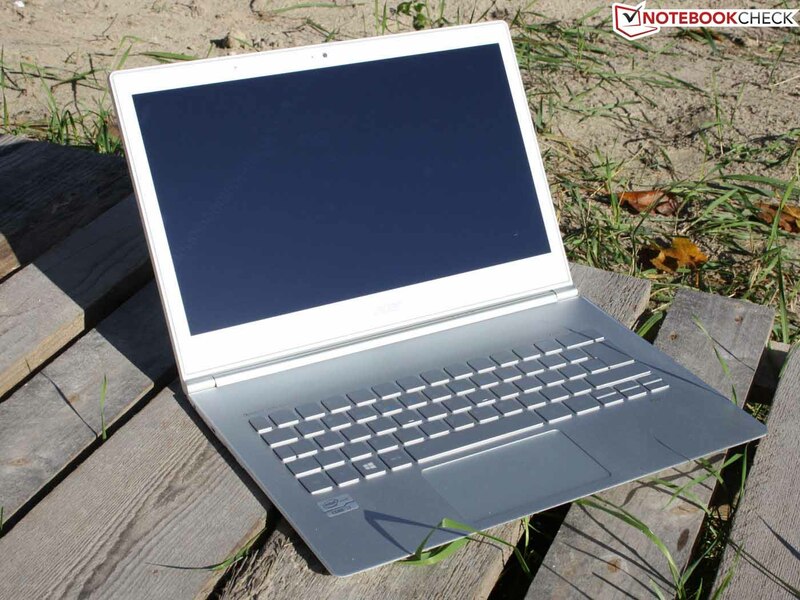 The Low Voltage system uses a bit more energy in idle than the 13.3-inch ultrabook competition. 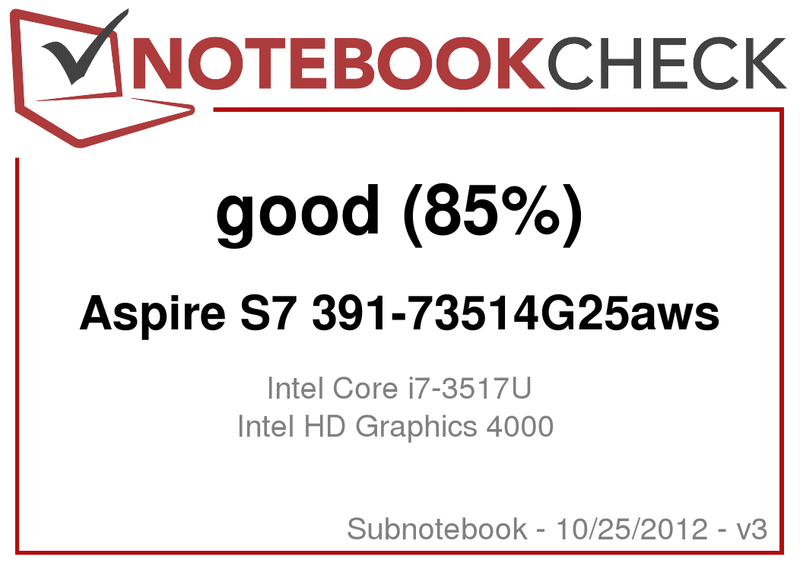 We measured 7.2 up to 11.6 W, which is easily more than the rivals: Zenbook Prime UX31A (4.4 to 10.3 W), Aspire S5-391 with the same hardware (4.5 to 6.5 W) and Samsung 900X3C (5.2 to 10 W). These values represent the minimum and maximum energy consumption in idle state. During the stress test (CPU+GPU) the power consumption rose to 35 W. When just the processor stress test was running (Prime95 Multi), the S7 consumed 32 W. The UX31A and Samsung 900X3C need more energy (~37 W @ peak load). An i5-3317U would hardly be more energy efficient here. Most of the 13-inch notebooks with this CPU consume about 36 W in the stress test (for example Envy Spectre XT 13-2000eg). 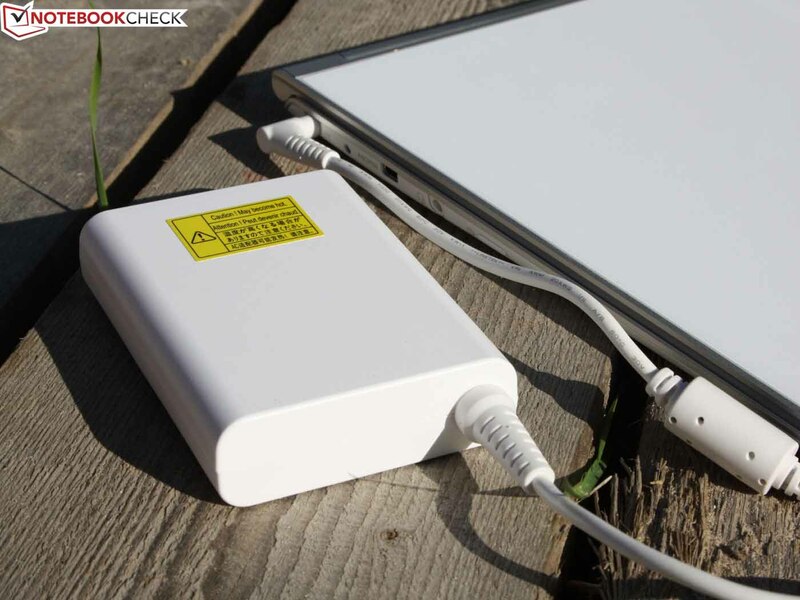 The battery (4680 mAh) is inferior in terms of capacity when compared to the competition: Samsung 900X3C (5880 mAh), MacBook Air 13 (6700 mAh) and Zenbook UX31A (6840 mAh). This reduces battery life, even though the system is no energy waster itself. 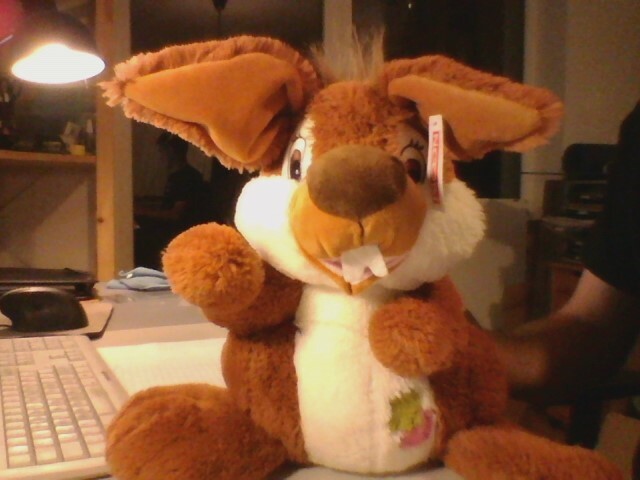 The WLAN test ended after 3:29 hours. The Air 13 (6:03 h), Series 9 900X3C (6:47 h) and UX31A (4:42 h) are significantly better. In idle state the S7 managed 6:39 hours. The idle run time is not practically feasible, since it is done with minimal brightness, deactivated wireless modules, and idle CPU. The WLAN test comes closer to reality: here the brightness is set at about 150 cd/m² and a script reloads web pages every 40 seconds (some with video content). 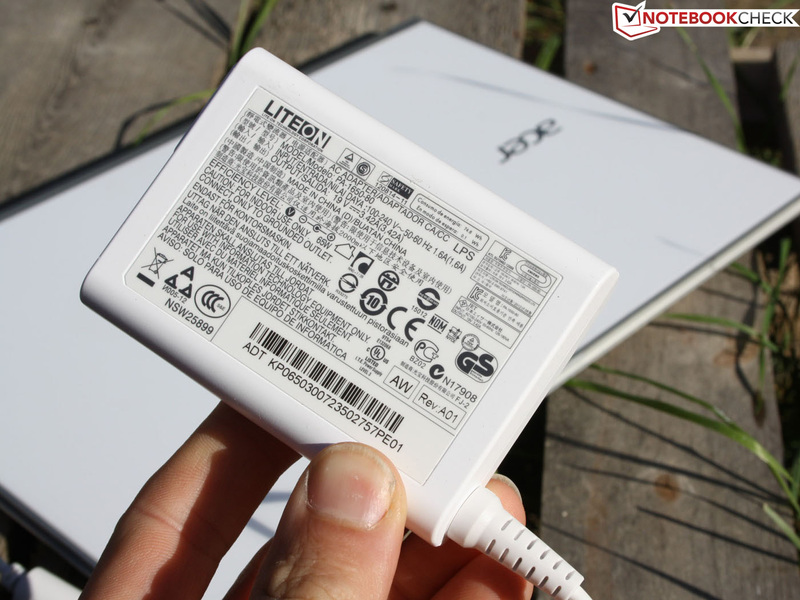 In order to help out customers, Acer offers a second battery, which can be mounted on the bottom (also 4680 mAh). It is connected to the notebook via a jack (on the left). 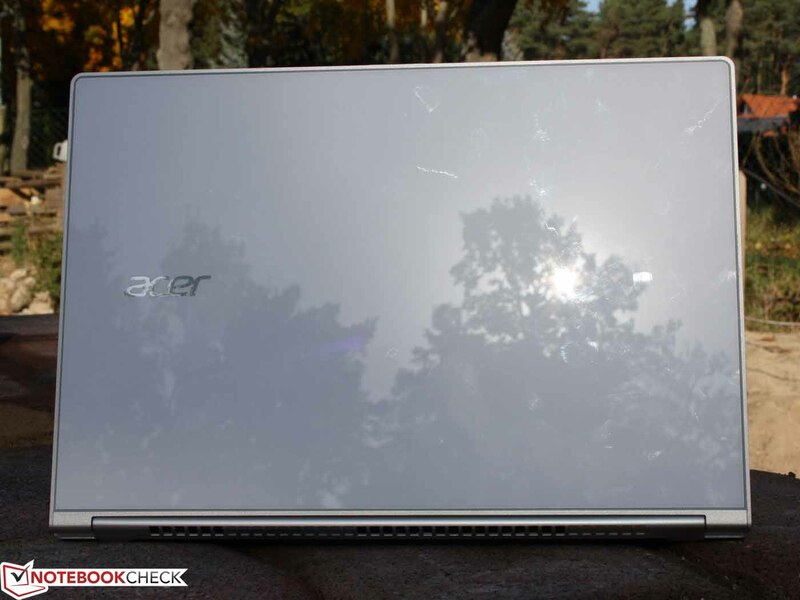 Without question Acer delivers an interesting and high-quality 13-inch ultrabook. It's the better S5-391, because the S7 has by far the higher quality display panel. The Full HD screen competes with the Samsung's Series 9 900X3C-A04DE (HD+) and the Asus Zenbook Prime UX31A (FHD) and can also be operated with fingers. Strictly speaking, the Zenbook has the ultimate IPS panel. 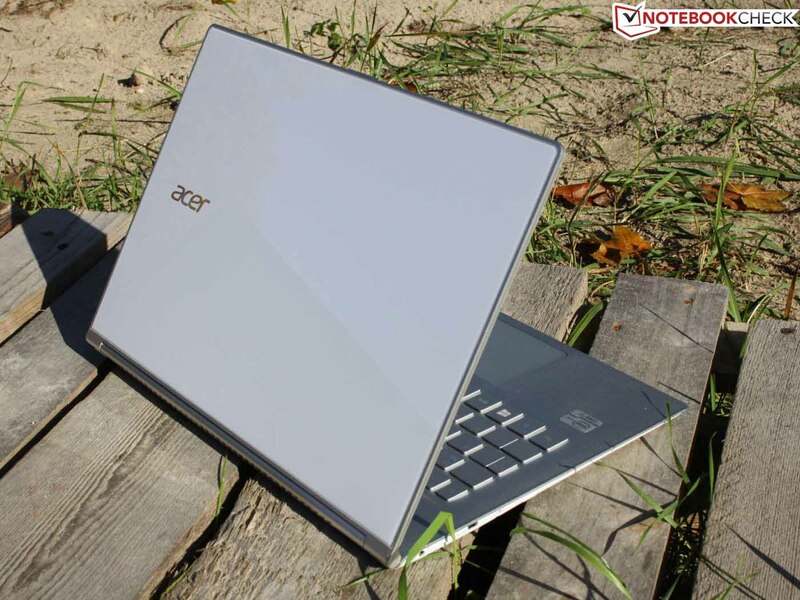 In terms of the design, Acer surpasses its rivals in dimensions (12 mm). 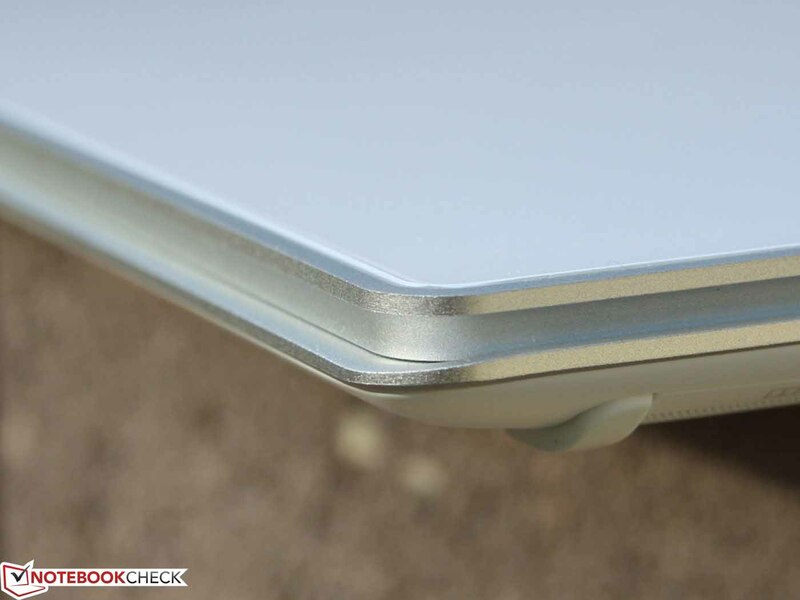 Zenbook (18 mm), Series 9 900X3C (13 mm) and MacBook Air 13 (17 mm) are all thicker. The weight of 1.27 kg is very good and even better than the MacBook Air 13: Zenbook (1.41 kg), Series 9 900X3C (1.186 kg) and MacBook Air 13 (1.35 kg). The case, made of magnesium, aluminum and Gorilla Glass II, sets new standards: it is not quite as solid and strong as those of the Zenbook or Air 13 (alu-unibody), but it is lighter and thinner. This puts into perspective the standard. We consider the construction to be overall on par with the competition - even without proper unibody. The performance should not suffer because of the thin case. Acer's idea of the two fans (TwinAir) is a good one. 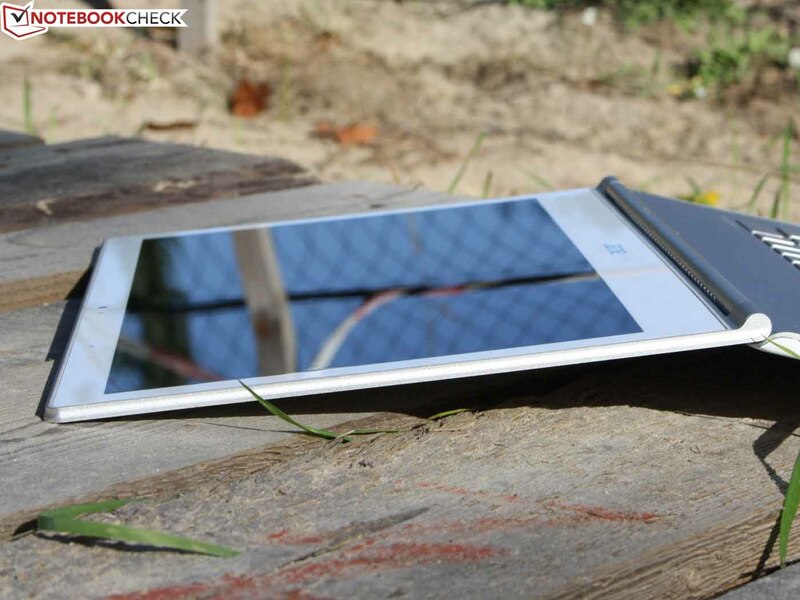 The i7 performs on the expected level, but the mobility suffers. On one hand the 4680 mAh suffices for only 3:29 hours (WLAN test), on the other the brightness dims down to 165 cd/m² on battery power (AC - 361 cd/m²). The panel is then too dark for outdoor use and the reflection of the glare type is really disruptive. Because of this we lowered the display rating by five points. As soon as Acer fixes this flaw with a BIOS update, we will inform you. It seems a law of nature that high temperatures and noise go together. This is not exactly the case here. Let's look again at our synthetic stress test. During normal use, the two fans gently slow down and speed up their rotation, thus causing no disturbance. The S7 becomes noisy only when playing games or under continuous load. Who needs a touch screen? We found the constant switching between the tiles of Windows 8 (Metro) and the classic desktop tiresome. In the latter, we preferred using mouse and touchpad, because of the high resolution. The touch screen is great for web browsing, as long as we reduced the resolution to 1600x900 pixels. The buttons are then simply easier to use. The alternative input methods, keyboard and touchpad, both have a good feedback, but the user will need to get used to the short key drop. 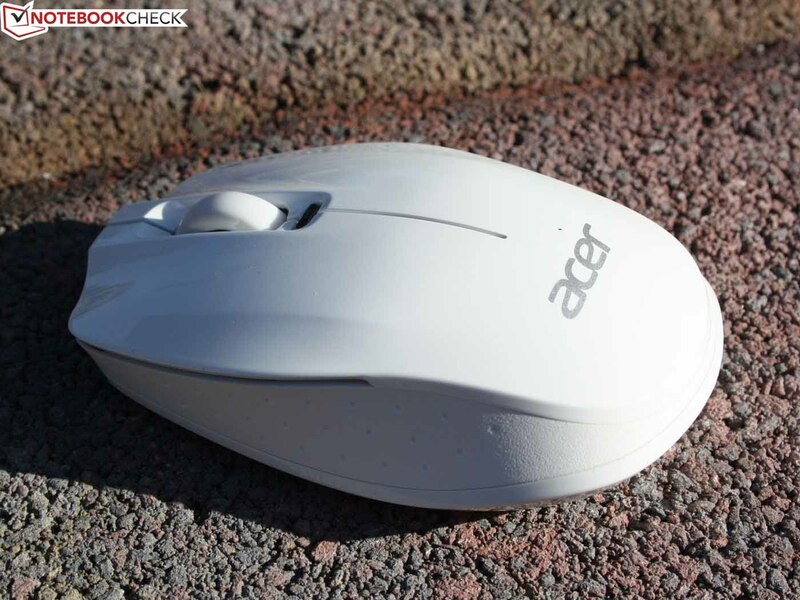 Has Acer managed to surpass the competition? In some parts - yes, but overall - no. In terms of workmanship, every high-end device, including the S7, is very good. But the Zenbook UX31A (1400 Euros, ~$1811) offers the better mobility (brightness, matte, battery life). The Series 9 900X3C (1520 Euros, ~$1966) is in the same category, has an excellent PLS display, but "only" a 1600x900 resolution. The MacBook Air 13 (1350 Euros, ~$1746) has even longer battery life, but also a glare type screen. Is our S7 overpriced in the high-end configuration at 1700 Euros (~$2202)? Not really, since the competition offers no RAID SSD and no touch panel. If the price goes down a bit (~1500 Euros, ~$1940), Acer's S7 will be absolutely competitive. Depending on the configuration (i5, 128 GB SSD), the customers already have the option of purchasing it for 1300 Euros (~$1684). The high-quality touch panel is on board in any case. 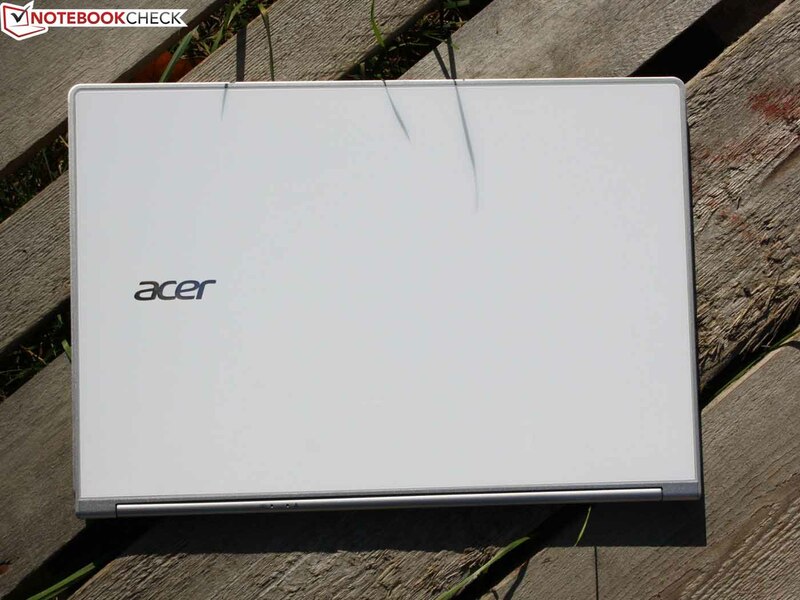 Acer S7-391-73514G25aws: flat, high resolution, and fast. 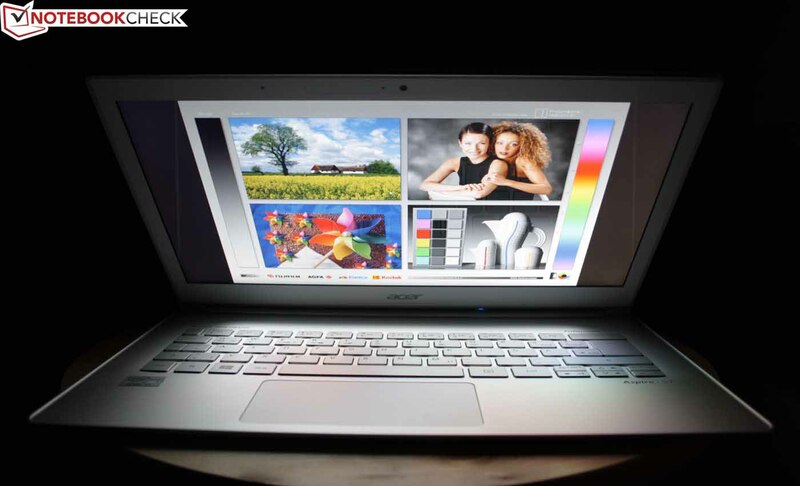 The S7 is a high-quality high-end ultrabook. 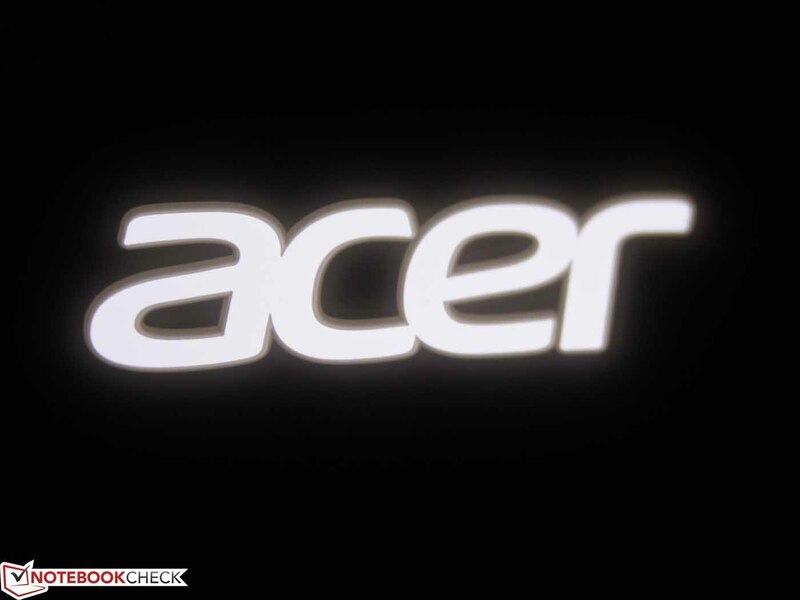 Acer usually aims at the lower and middle price range. so the keyboard has a multi-level backlighting. The viewing angles, stable in all directions, of the IPS panel are very pleasant. It has a good contrast ratio of 500:1.
we find a micro-HDMI to VGA and USB to Ethernet adapter in the box. 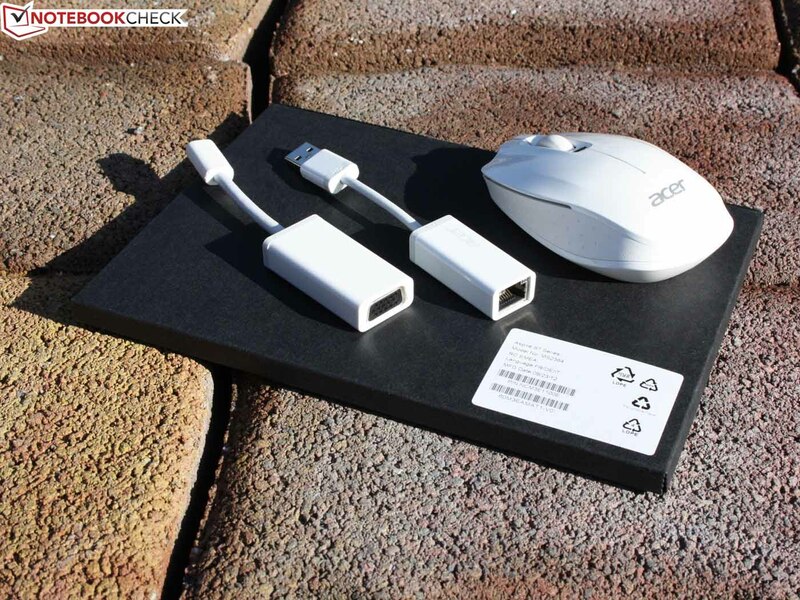 The Bluetooth mouse, as well as the rest of the accessories, comes in white. This creates a harmonious composition. The power supply and the cable are also in the same color! but a firm stop. 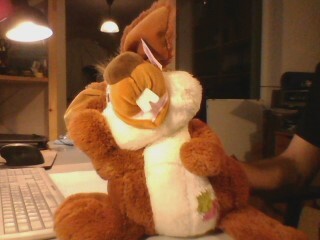 The whole is well fixed, nothing wobbles. The same goes for the ClickPad (short stroke). Good to know: "How do I turn my computer off." This is a small challenge with Windows 8. In terms of height, the USB 3.0 ports have barely managed to fit. But HDMI is shrunk down to micro-HDMI. 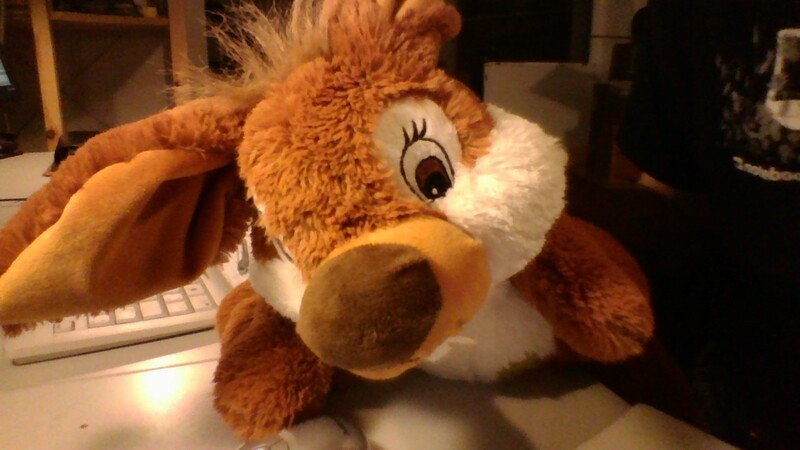 The webcam has a resolution of 1280x720 pixels and takes relatively good pictures even in low light. Acer S7-391: a successful high-end debut and, thanks to the very good IPS panel, better than the S5-391 (also 13.3-inches). 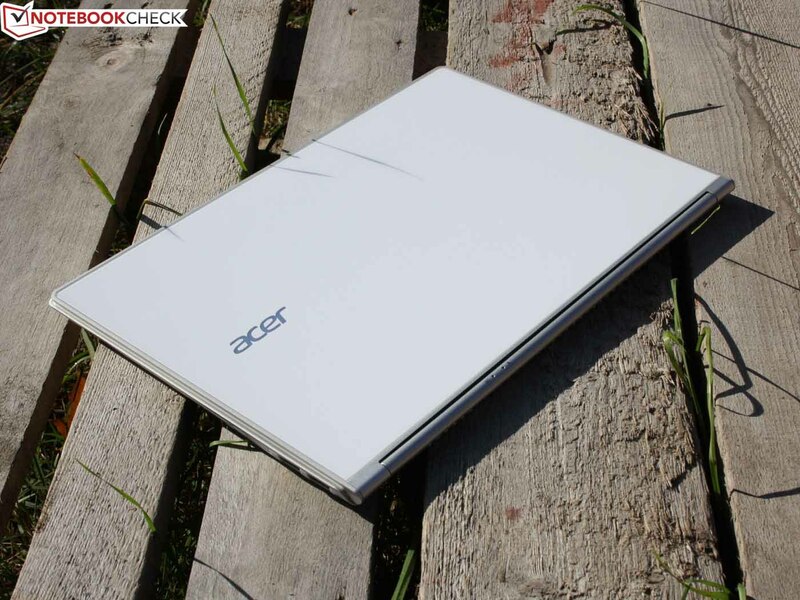 Acer S7-391: 12 mm, only the S7 is so thin among the 13-inch ultabooks. 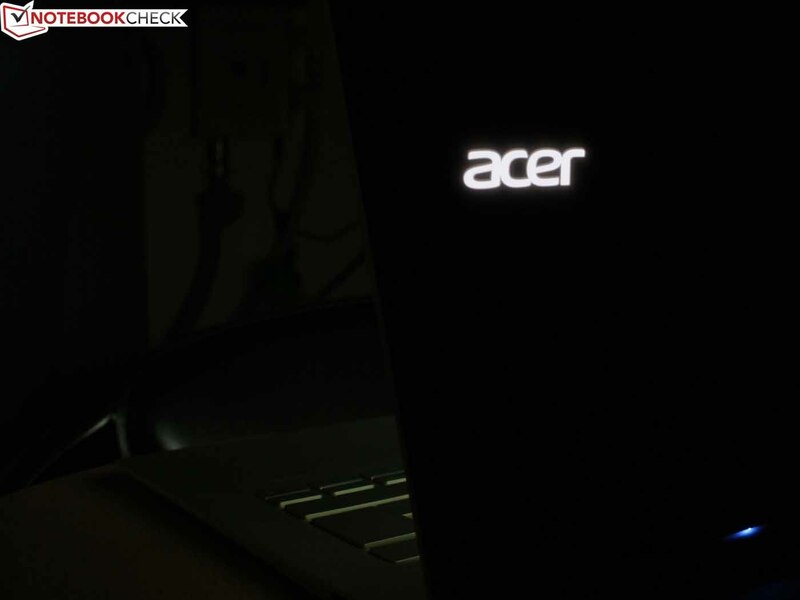 The Acer logo on the lid is illuminated via LED backlight. 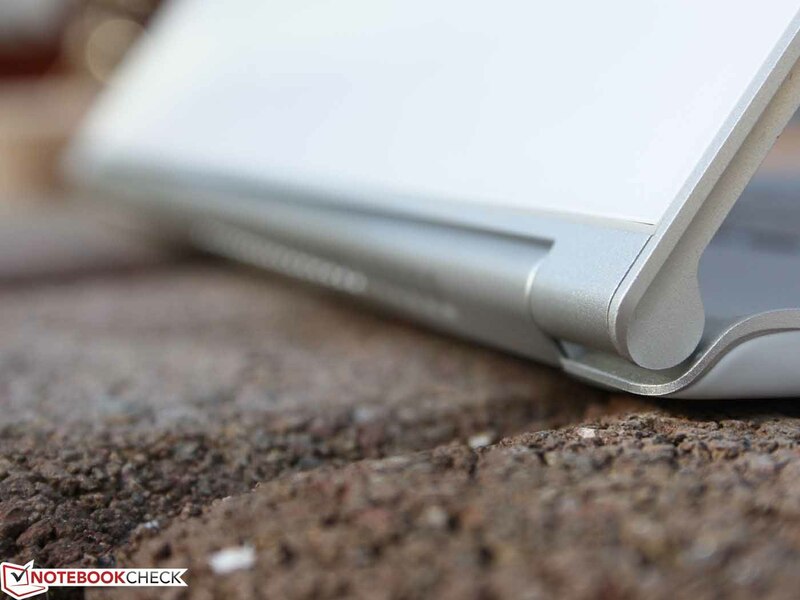 The ultrabook S7 is a step in a different direction. 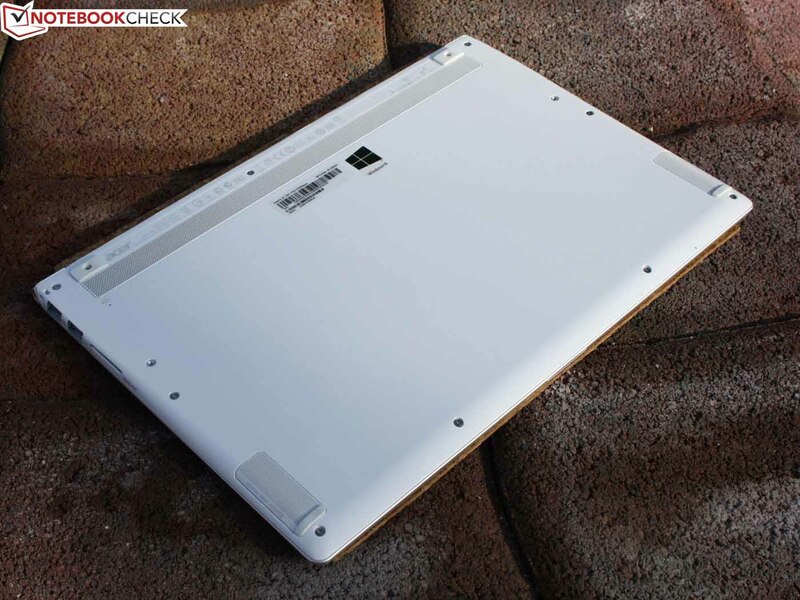 It is a 13.3-inch premium subnotebook that will strike fear into the competition. In addition, Acer has installed for the first time a high-quality IPS panel with Full HD resolution (touch screen). The case sets new standards in terms of engineering. The surface of the display lid is made of Corning Gorilla Glass II. but it is not made of Gorilla Glass. The chassis is only 12 mm thick. Unfortunately the feet add 1.5 mm. therefore we cannot blame Acer. Intel's 20 mm reference is significantly surpassed with 12 mm. The competition does not offer such a thin ultrabook. The Samsung Series 9 900X3C (13 mm) comes closest. 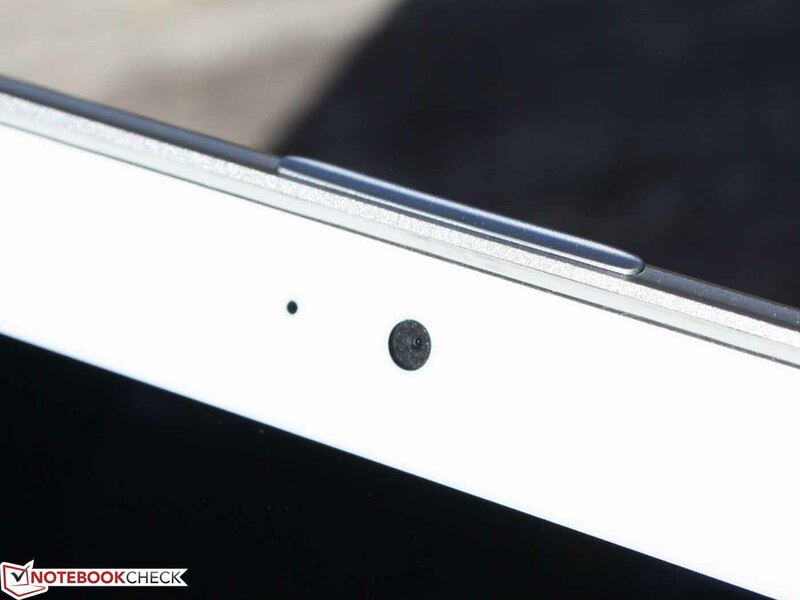 The stability of the device is excellent relative to the thinness. 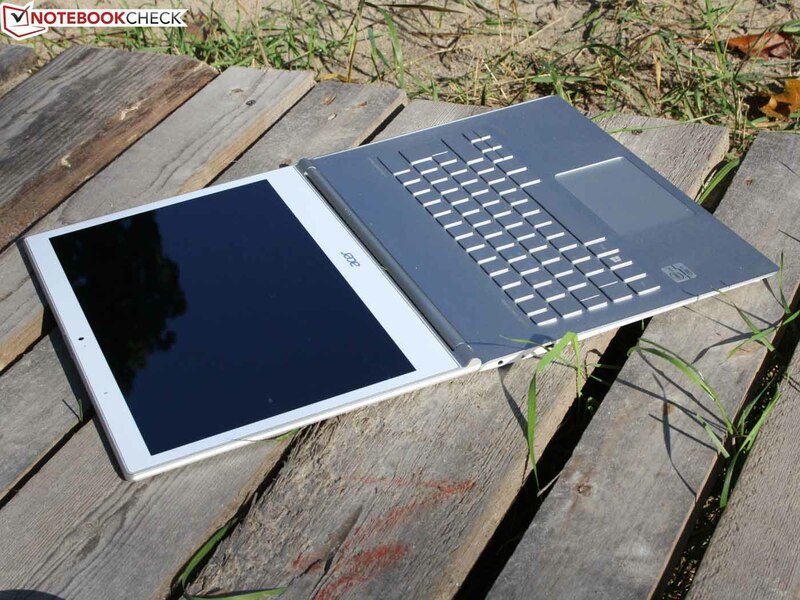 In absolute terms, the unibody MacBook Air 13 and Asus Zenbook UX31A are better. The base unit (upper and lower) are made of light magnesium. 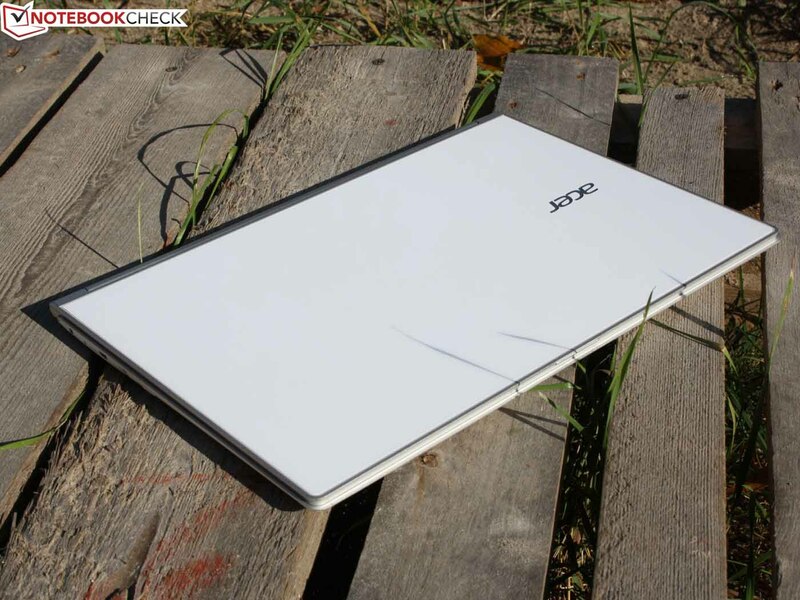 Acer S7-391: in view of the slim case, the stability is very good. The IPS panel with bright colors and wide viewing angles. Rigid base unit, despite the height of only 8 mm. The Gorilla Glass lid provides a fresh look and added strength. Higher brightness on battery power. But then the battery life would be even shorter. 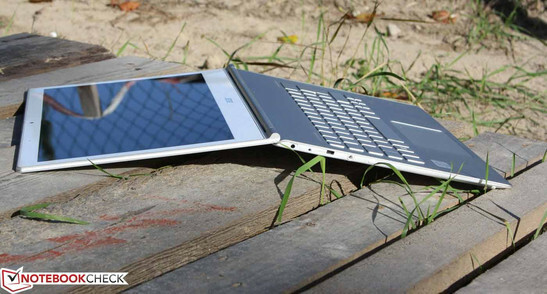 Core i7 in a slim chassis without throttling and with acceptable heating and noise. Asus Zenbook UX31A (FHD IPS, Alu-Unibody), Samsung Series 9 900X3C (PLS), Apple MacBook Air 13 (Alu-Unibody).